Several years back, I was writing a story in which the main character was a chef. She had this idea of opening an Italian tapas restaurant. How could that not be a hit, she wondered. Everyone loves Italian food, and everyone loves appetizers. I abandoned that story, but I’m sure it would’ve worked out well for my protagonist – most things did. But as I said, I was writing that many years ago, and never really thought of the idea again. One day about a year ago, we noticed that the Italian chain next to one of our favorite Irish pubs had closed down. A huge ‘Now Hiring’ banner hung in the parking lot for the soon-to-come restaurant – Spuntino Wine Bar and Italian Tapas. 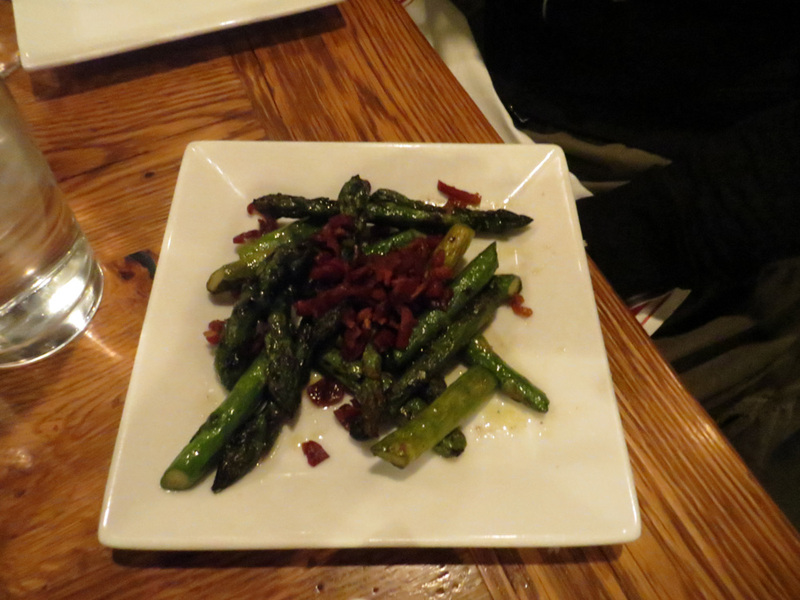 I was so excited, though I had no idea what to expect, since I’d never been to any tapas restaurant. And I was worried that this would be another chain… which generally means sub-par “Italian” food. 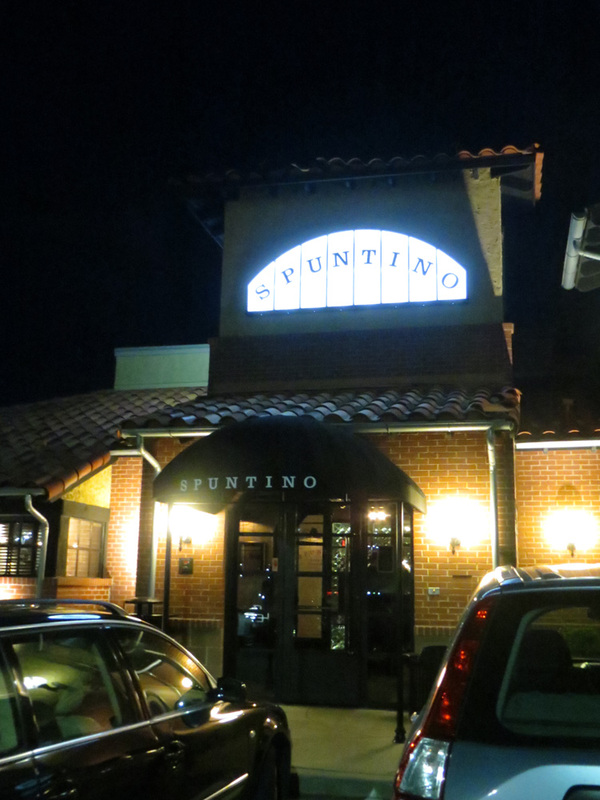 As it turns out, Spuntino is not a chain. That’s not to say it won’t end up with multiple locations, since the owners run franchises of some very popular chains (including, I just discovered, the above-mentioned Irish pub next door). 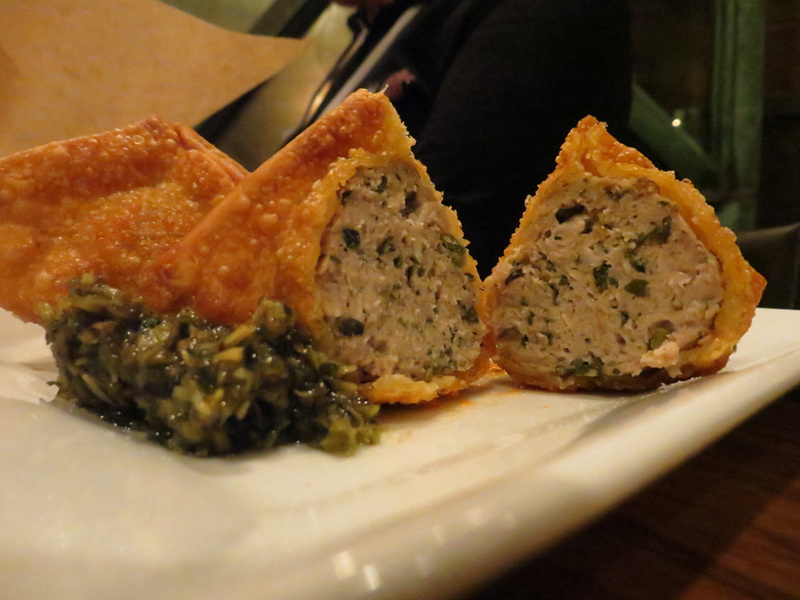 Dan and I visited Spuntino soon after they opened, and have returned several times since. On our most recent visit, we were joined by Dan’s cousin Steve and his girlfriend Dominique. They are both foodies and wine lovers just like us. It was a Saturday night, and we arrived around 8:15. It was fairly busy, and we were told the wait would be 45 minutes. We found a spot at the bar. The bar area is on the left side of the restaurant. The bar top itself is a gray and white marble slab, and at one end, you can watch as Italian cheeses and cured meats are cut to order. Since we had a substantial wait ahead of us, we ordered our first bottle of wine. 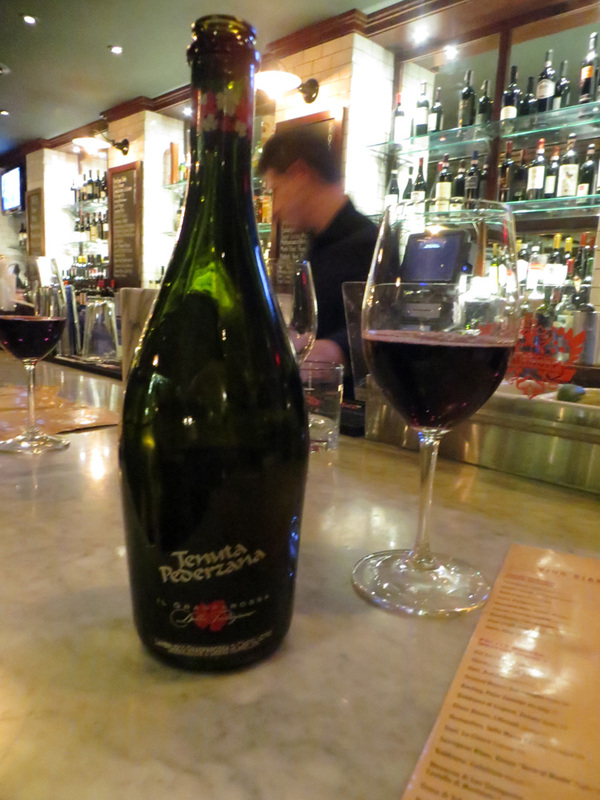 We chose a dry, sparkling red – Lambrusco Tenuta Pederzana ($40). Dry sparkling reds are just slightly sweeter than regular brut champagne. This was a perfect pre-meal drink. It was just short of 45 minutes from our arrival time when our pager went off. We were escorted to our table on the other side of the restaurant. The center section is the largest, with butcher block tables and slick, semi-circle booths. The smaller section on the right side, where we were seated, is more rustic. Dark wood walls and small wire-and-bare-bulb light fixtures make this section very cozy and intimate. A ‘Reserve’ wine list was on our table when we sat down. Dan and Steve each pored over it. Our waiter came over and offered to send the sommelier to our table. I’ve honestly never been to a restaurant where a sommelier was on hand at all times. She soon arrived, and was incredibly pleasant and knowledgeable. Steve is a recent graduate of the Viticulture and Enology program at Washington State University, so he knows quite a bit about wine. Even he learned a great deal from the sommelier – though not nearly as much as the rest of us, of course. 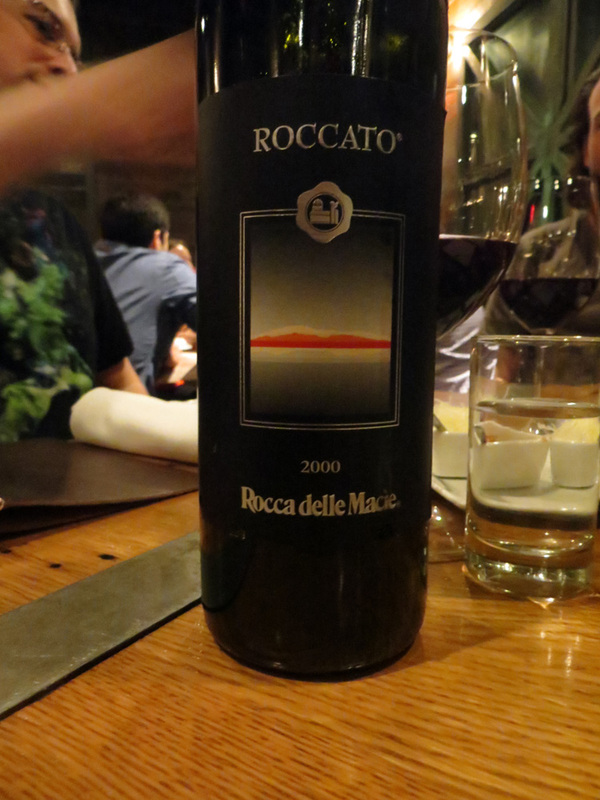 The boys chose Rocca delle Macie, a Super Tuscan. Our sommelier offered to decant our wine for us. Older wines need to breathe more than most. We gladly accepted the offer. Still, even once decanted, we all realized that this wine would need about an hour to breathe before reaching optimal taste. That in mind, we chose another bottle to drink in the meantime. Dominique dubbed this our ‘appetizer wine’. Aglianico is a grape I’d never heard of until I started going out with Dan 4+ years ago. It’s not easy to find… but the few we’ve found have been pretty spectacular. 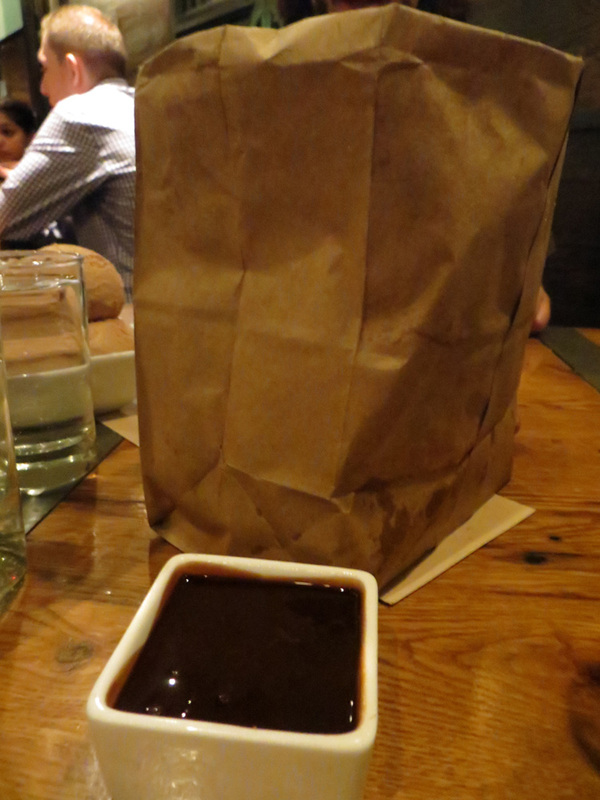 Our previous trip to Spuntino found us ordering the same bottle, and it was off… Corked, maybe. It tasted like wet leaves. When we pointed this out to our sommelier, a new bottle was brought to our table immediately. The same thing happened on this visit. Sometimes wine isn’t stored properly – it happens. Our sommelier on this visit tasted our wine and knew right away it wasn’t right. 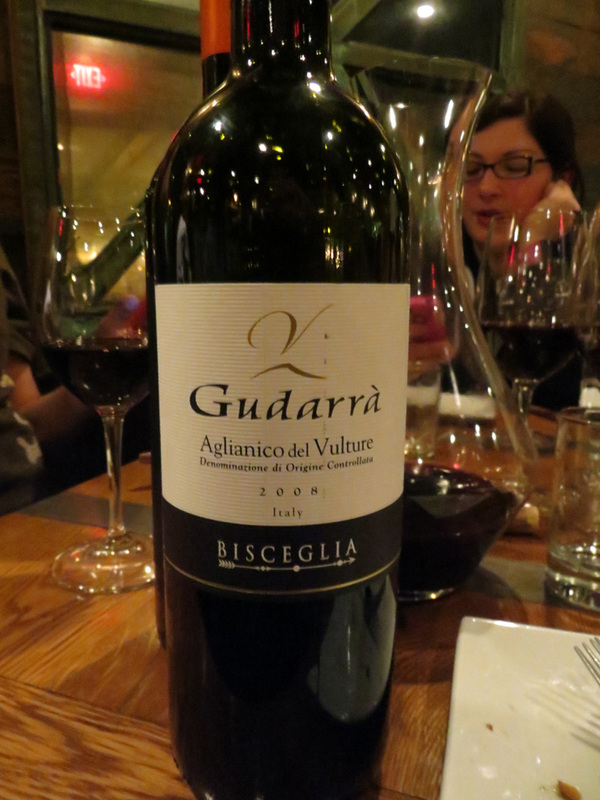 A new aglianico was brought to our table, and it was perfect. But on to the food! We like to space out our meals all the time, no matter what type of restaurant we’re dining at… but this is especially important at a tapas restaurant. 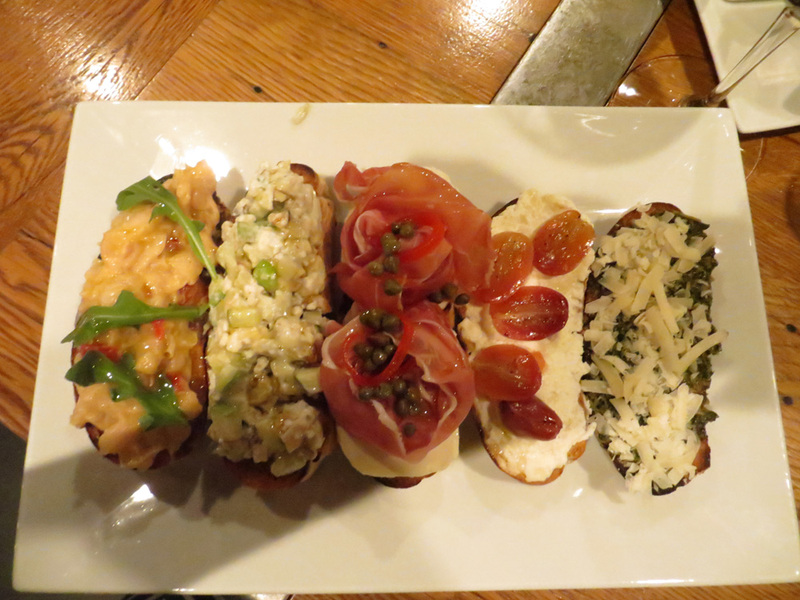 We started with bruschettas. They are priced at $3 each, or 3 for $9, or 5 for $14. We chose 5, of course. Cannelini Beans, Gorgonzola with Apples and Walnuts, Prosciutto & Mozzarella, Ricotta with Roasted Grapes, and Basil Pesto. I don’t like beans, and in this case, that worked in my favor. Steve and Dan thought the Cannelini Beans were bland and boring. The Gorgonzola with Apples and Walnuts was absolutely delicious – perfect mix of sweet, salty, and earthy. It’s my favorite. The Prosciutto & Mozzarella was also great – almost no fat at all in the prosciutto, which is hard to find. The ricotta and roasted grapes was a sublime creamy and fruity combo. The basil pesto got raves as well. Our next course was all about meat and starch. We all wanted meatballs! 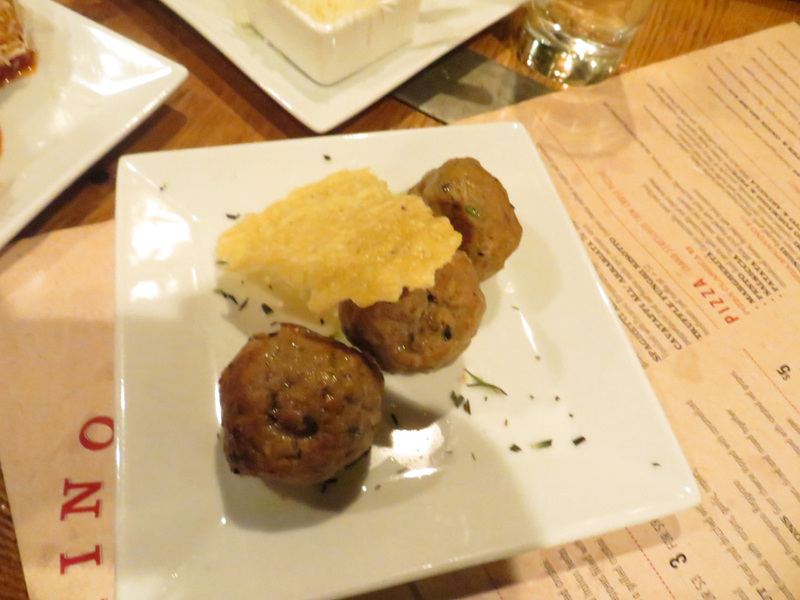 We thought, from reading the menu incorrectly, that we had ordered 2 lamb meatballs, and one spicy pork meatball. What arrived at our table, though, were 3 orders of 3 meatballs each, leaving us with 3 spicy pork, and 6 lamb. 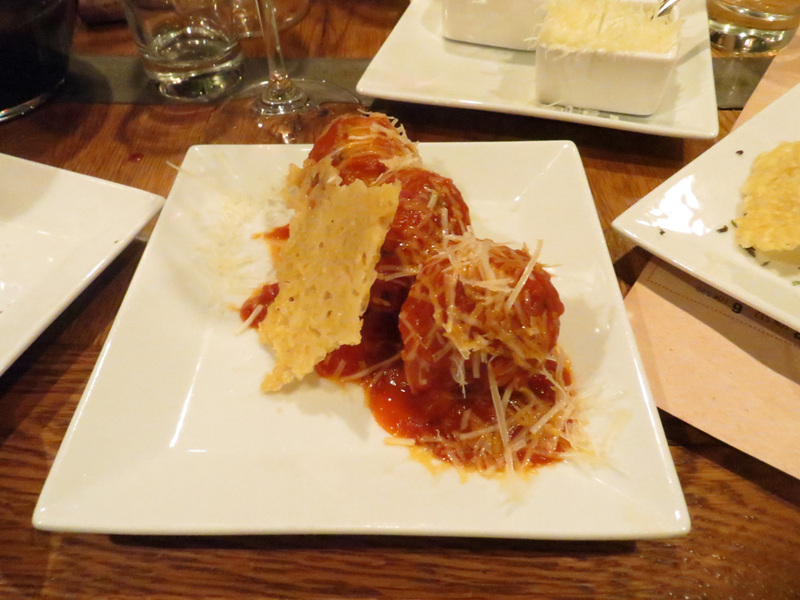 We didn’t complain and ate all of them happily… in addition to the Crispy Meatballs (, the Arancini, and the Truffle fries that we ordered for this course. These were actually quite red pepper-spiced. Very tasty. I adore the flavor of lamb and rosemary. I believe I ate more of these than anyone else. The boys were much more interested in the spicy pork. 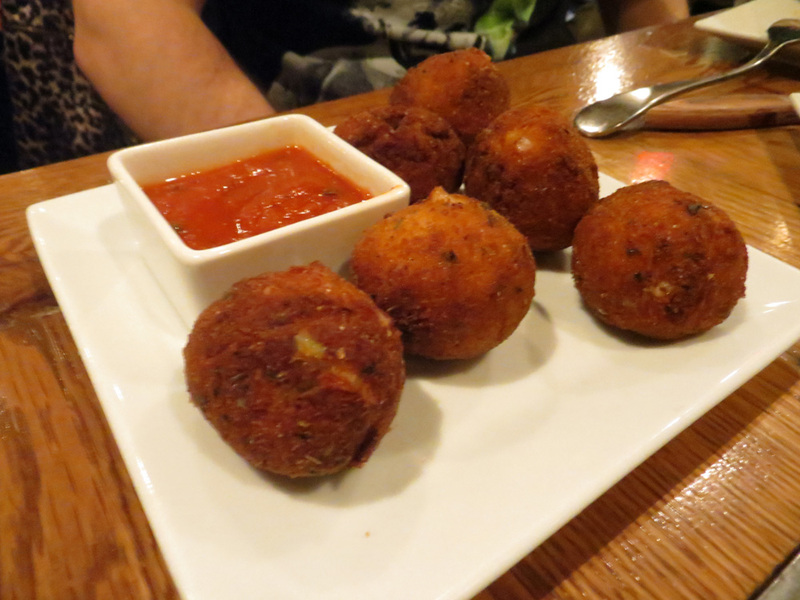 Deep fried meatballs. Need I say more?! 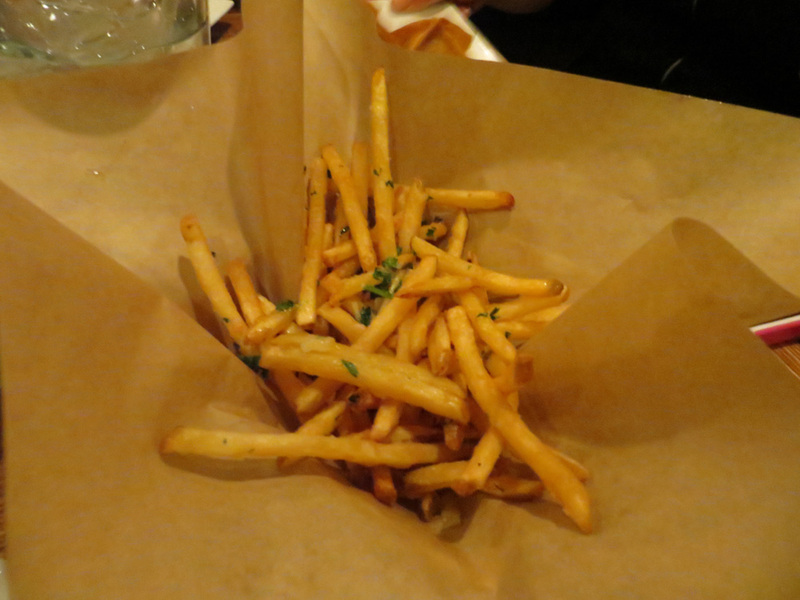 These were unanimously voted the best truffle fries any of us had ever had. No question. Crispy, and with lots of truffle oil. We could smell the truffle oil from another table while we were still enjoying our bruschettas, and that’s what made us order them. So glad we did! Rice balls are one of my favorite things to eat in the world. While these aren’t the best rice balls I’ve ever tasted, they are quite good. Dan usually doctors his up with red pepper flakes and parmigiano cheese. I just add a little salt and I’m good to go. This was a special that night, and is not on the regular menu. The prosciutto was crispy, like bacon. Very good! 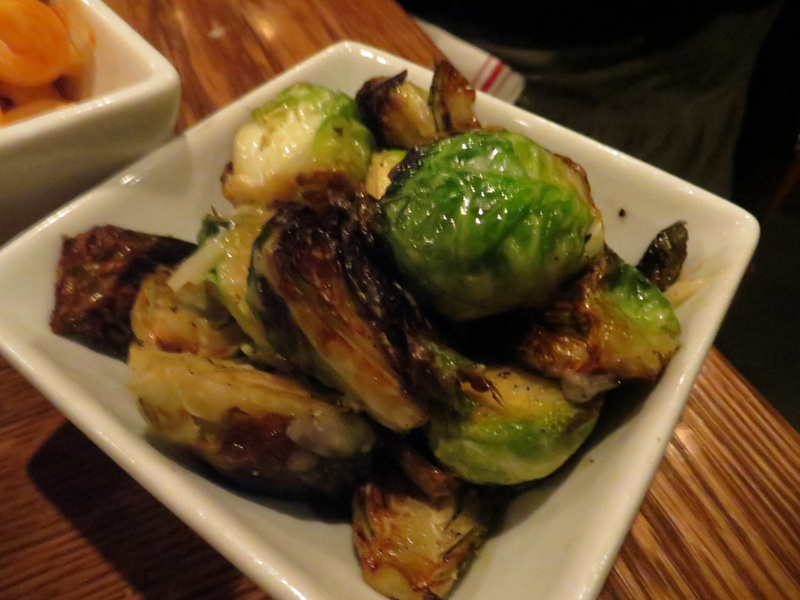 Nicely sauteed, great freshness and flavor. 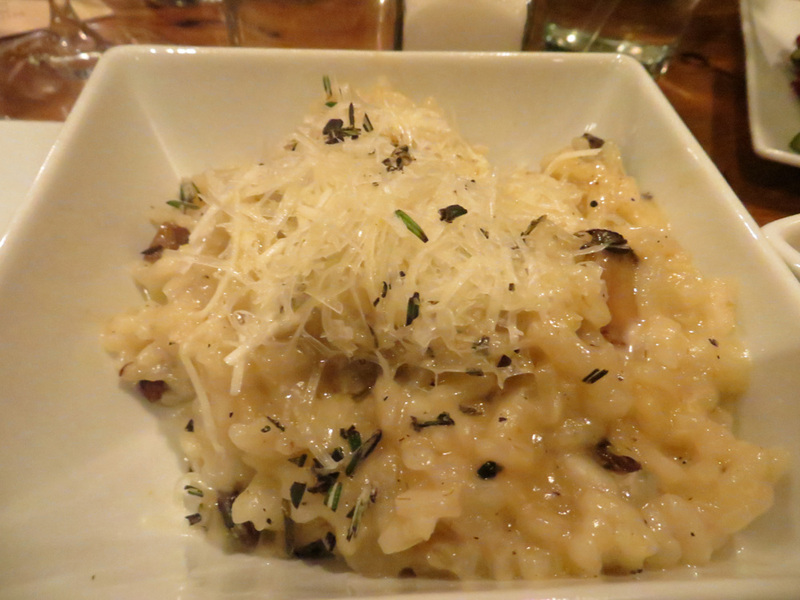 Truffle Funghi Risotto – Fontina cheese melted in risotto with portobello mushroom and truffle oil, $10. Aside from simply saying ‘Oh My God!’, I don’t think there are words to do this justice. We were all making various ecstatic faces and noises while eating this risotto. It’s just that good. You may recall from my Jiko review that I tasted wild boar for the first time only a few months ago. This was quite a different preparation, but it was also delicious. 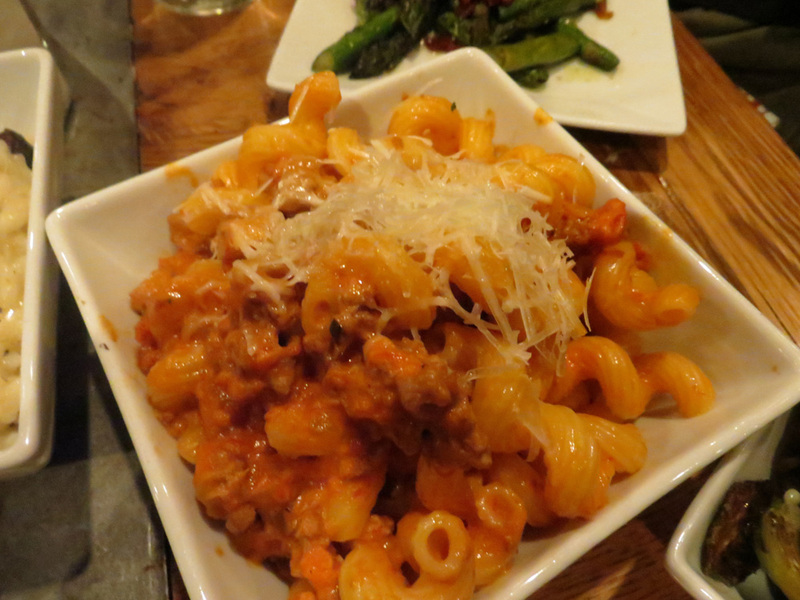 The pasta had a great texture, and the wild boar ragu was seasoned very nicely – like a high-end spaghetti with meat sauce. We finished up that course and our wine, and the sommelier came over to talk to us again. She really was wonderfully engaging, and had an impressive resume of her sommelier experience. Listening to her talk was a pleasure, and she spent a great deal of time with us. It really added a special feeling to the meal. 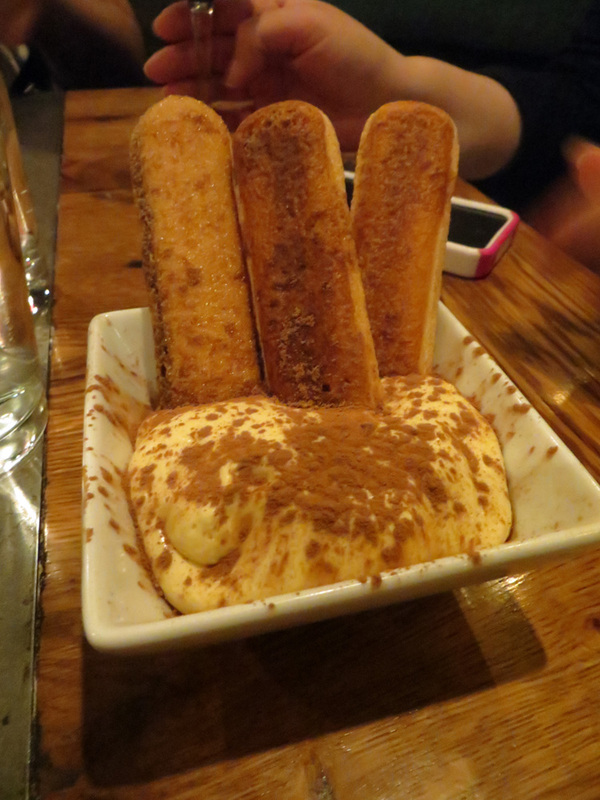 The mousse was creamy and tasted great, but I found the ladyfingers a bit too crispy this time. On previous visits, they were more spongy and more to my liking. These are essentially zeppoles. 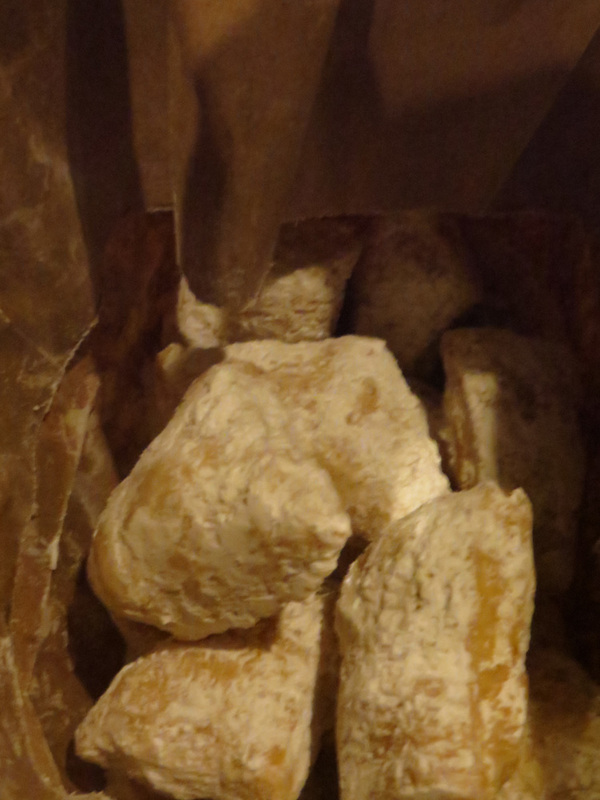 They arrive at the table hot and covered with powdered sugar, and are served in a paper bag, like zeppoles from any good pizza joint. They are fabulous! This was also a special and is not on the regular menu. 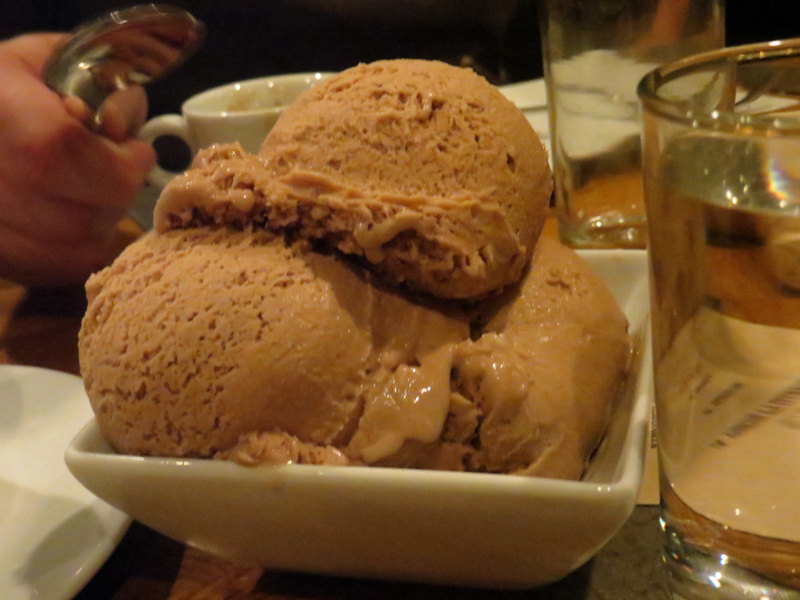 Unbelievably good – especially once we decided to see how the ciambelle tasted with a dollop of gelato on top. I have thought of that flavor combination every single day, at least once, since that night. Mouth watering! Quite a lot of food, it seems, but since there were 4 of us, and we shared everything we ordered, none of us were feeling overly full. This is not the type of place I would recommend to people who don’t like to share. Sharing not only allows you to taste more of the menu, but to interact with your dining companions even more. It creates conversation and enhances the meal, making it a memorable event. Great atmosphere, incredible food, friendly, attentive service, and surprisingly reasonable prices. They allow (and even encourage you) to take your time with your meal, to really enjoy everything. You never feel rushed or like they’re trying to turn tables, no matter how busy the restaurant is. We couldn’t ask for more, and will undoubtedly return! This entry was posted in Eat Like a Local, Foodie Tales and tagged Arancini, Asparagus with prosciutto, Basil Pesto, Best Tapas Clifton New Jersey, Brussel Sprouts, Cannelini Beans, Chocolate Rum Tartufo Gelato, Ciambelle, Clifton, Clifton New Jersey, Crispy Meatballs, Deconstructed Tiramisu, Gorgonzola with Apples and Walnuts, Lamb Meatballs with Rosemary and Olive Oil, New Jersey, Prosciutto & Mozzarella, Ricotta with Roasted Grapes, Spicy Pork Meatballs, Spuntino, Spuntino Wine Bar & Italian Tapas, Spuntino Wine Bar & Italian Tapas Clifton New Jersey, Tiramisu, Truffle fries, Truffle Funghi Risotto, Wild Boar Ragu, zeppoles by Gillian Smith. Bookmark the permalink. Gillian is a native New Yorker living in New Jersey with her boyfriend and their cat. When she's not busy providing technical support in the exciting world of mainframe software, she enjoys singing, writing, Disney World, and nights full of good food and fine wine with her friends and family. 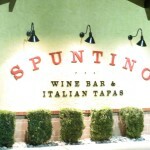 We LOVE Spuntino! We were hesitant too when we first saw it, especially with my very picky Italian father. Pleasantly surprised though. Addicted to the zeppoles. Rice balls I agree aren’t the best, but they do the trick. My favorite dessert from them though? The Affogato. Vanilla Ice Cream with Espresso poured over. Awesome. Hmm…you guys just reminded me I haven’t been there in awhile. Great review, G. Made me hungry. Also made me wish I lived in NJ. Crazy, right? Nicely done.